Luas Tram - Red Line (Dublin), originally uploaded by infomatique. A few years ago I heard jokes about anti-social behavior on the red line but at the time I thought they were typical North/South side jokes (OK, I know that both lines are mainly on the south side). However, now that I have an annual pass and use both lines almost daily I now appreciate why many people try to avoid using some stops (for example Jervis) on the red line. 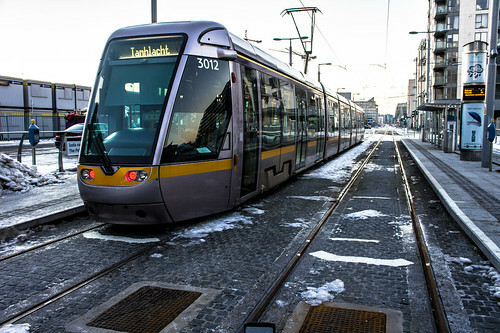 According to a report in the Irish Independent: Almost 1,000 reports of antisocial behaviour on the Luas were recorded last year -- including incidents of racist and threatening abuse directed at staff. Veolia Transport, which operates the light-rail system, said verbal abuse, both onboard the trams and at stops, accounted for the bulk of the incidents, with the vast majority of cases occurring on the Red Line. A spokeswoman said that while outbreaks of anti-social behaviour have increased, passenger numbers have also jumped from 27.4 million to 29.4 million last year, and more stops have been added. "Much of the public disorder is verbal abuse and the abuse at staff tends to be racist and threatening in tone," the spokeswoman said. "Anti-social behaviour is an issue for the city of Dublin and Veolia is working with many others to reduce incidents on board trams and at stops." There were 970 reported incidents last year, up from 870 in 2010. Three-quarters of the incidents occurred on the Red Line, and the remainder on the Green Line.